Xi Series Boost productivity in the most demanding conditions with Zebra's most rugged line of label and tag printers. Count on high print speeds and outstanding quality. 105SL Plus Series Ideal for economical, high-performance printing, the all-metal 105SLPlus printers provide reliable and durable printing for demanding applications. Multiple connectivity options means the 105SLPlus is an easy fit into existing operations. Z-Series Z series printer family has RFID upgradeability for smart label encoding. This industrial printer allows for speedy, high volume printing perfect for item labeling, package labeling, shipping and compliance labeling. ZT-200 Series Designed with ease-of-use in mind, the ZT200 Series offers reliable printing for a wide variety of applications. Whether you are adopting bar coding for the first time, upgrading your printers or replacing printer models, the ZT200 Series offers the right choice for most labeling applications. G-Series GC Zebra's feature rich, competitively priced GC420 desktop printers bring Zebra quality, durability and reliable performance to many low to medium volume, direct thermal and thermal transfer printing applications. G-Series GK These desktop label printers are the perfect investment for companies wanting to automate their processes. Easy to use and compact, they fit a variety of applications. G-Series GX Meet your labeling needs with these versatile and compact desktop label printers. Space saving, feature-rich and user friendly, these thermal label printers are a smart choice. HC100 Wristband The only wristband printer in the industry that offers easy to load media cartridges to provide user friendly, hassle free printing. 2824 Plus Choose these desktop label printers when time and space are limited. Their compact designs and fast print speeds mean they'll fit anywhere. QLn Series Drop-resistant and lightweight, the user-friendly QLn mobile printers help you print barcode labels, receipts and more, wherever and whenever needed. RW Series Arm your mobile workforce with the ability to print receipts, invoices, labels and more on the go. Built to last, these wireless mobile printers withstand the elements. P4T Series Zebra P4T/RP4T mobile printers offer reliability and are the first mobile thermal printers to offer RFID printing/encoding capability. Print lifelong barcode labels wherever needed. iMZ Series This lightweight, compact mobile printer makes it easy to simplify transactions with receipt and invoice printing on demand. Choose from a variety of wireless options, including the ability to work with the latest smartphone and tablet Operating Systems. EM220II Series Boost productivity by simplifying transactions using the latest wireless options, including the ability to work with the latest smartphone and tablet Operating Systems. The EM220II is pocket-sized and lightweight enough to wear all day. R110Xi4 RFID This high-performance RFID encoder and printer delivers superior flexibility, high print speeds, and high media roll capacity for more productivity. RZ Series RFID Meet all your item-level tracking needs and better manage logistical operations with an innovative line of RFID encoders and printers designed for a number of applications. ZD500R RFID Bring UHF RFID printing to your desktop. This small, easy-to-use printer delivers advanced features in a compact footprint for convenient, simple operation. RP4T RFID Designed for a variety of industries, this lightweight yet durable, RFID mobile printer solution enables you to print and encode RFID tags and barcode labels on the go. RPAX RFID Easily label cases, pallets and more with a print engine designed for high-volume RFID printing applications. TM-T88V Epson's latest addition to the best-selling TM-T88 series, the TM-T88V, offers 50% faster printing than the TM-T88IV, prints text and graphics at the same fast speed and is the most reliable in its class. Also available with Bluetooth to support iOS and Apple devices TM-T70II The TM-T70II is Epson’s latest space-saving POS receipt printer. It easily fits under counters, offers fast reliable printing and all-front access for operations and maintenance. TM-T20II The TM-T20II POS printer is ideal for customers with a lower volume of transactions that want a high-speed, reliable printer with easy-to-use features. Mobilink P60 Bluetooth Epson’s Mobilink P60 mobile printer with Bluetooth support for iOS is available to meet the need for highly reliable Bluetooth-based mobile printing from any Apple iDevice. Mobilink P60II Epson’s Mobilink P60II printer features the fastest printing in its class, industry-leading battery life, ruggedized design and supports all the leading mobile operating systems. Also available with Bluetooth to support iOS and Apple devices Mobilink P80 The Mobilink P80 three-inch receipt printer offers the speed, reliability and connectivity options needed to meet the requirements of today's mobile printing applications. TM-U220 Powerful successors to the TM-U200 series, the TM-U220 series is optimized for faster throughput, crisp two-color printing and greater cost savings. TM-U325 The TM-U325 is a cost-effective validation/receipt printer designed to meet the need for high reliability and a small footprint. It features multiple-line validation and selectable fonts. TM-T88 ReStick The advanced TM-T88 ReStick™ liner-free label and receipt printer prints repositionable labels for a wide range of food service, retail and grocery applications, plus crisp, clear receipts. 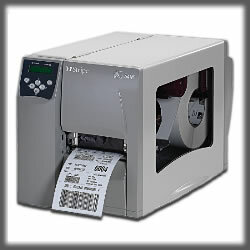 TM-L90 The cost-effective TM-L90 thermal label and barcode printer offers one- and two-color printing, automatic label peeler option, software for rapid label design and wired or wireless connectivity options. It also can be used as a receipt printer. ColorWorks C3400-LT Epson's C3400-LT terminal offers everything you need for fast, on-demand color label printing in one compact unit for locations where space is limited. ColorWorks C3500 Epson's ColorWorks C3500 inkjet label printer with Just in Time Color™ offers fast, on-demand four-color label printing at speeds up to 103mm/second.